You may already be taking medicines — either prescription or over-the-counter — to relieve morning stiffness, inflammation and pain in your joints. But many studies show that certain foods, spices and supplements may help in addition to medicines. 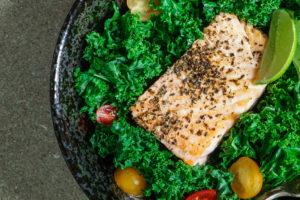 We talked with registered dietitians Kylene Bogden MS, RDN, CSSD, LDN and Liz DeJulius, RDN, LDN about which healthy foods may help ease your joint pain. Here’s their recommendations on what to eat. Many studies have found that the Mediterranean diet has various health benefits, some of which seem to overlap those attributed to nonsteroidal anti-inflammatory drugs (NSAIDs). A Mediterranean diet consists of a high level of low-glycemic fruit, vegetables and legumes; a high level of unsaturated fats, especially olive oil, complemented by a modest amount of alcohol, mainly in the form of wine; a moderate to high level of wild fish; and a low level of dairy products and red meat. A 2015 Michigan study showed correlations between a whole-foods, plant-based diet and significantly improved self-assessed functional status and reduction in pain among adult patients with osteoarthritis, Ms. DeJulius says. A whole-foods, plant-based diet consisted of fruits, vegetables, legumes and grains and is free of refined foods, which follows the Mediterranean approach. The beneficial effects of fish oils are attributed to their omega-3 fatty acid content. Studies of fish oil consumption show that it has anti-inflammatory benefits and is particularly helpful for joint pain. Natural sources of fish oil include cold-water fish, such as wild salmon, trout and sardines. Vegan and vegetarian sources included flax seed, chia seeds and organic soybeans. A 2008 Australian study is one of many that showed fish oil reduced joint pain, increased cardiovascular health and reduced the need for NSAIDs. “Just one serving of cold-water fish twice a week is enough,” Ms. Bogden says. She recommends a high-quality daily fish oil supplement in addition to consuming natural dietary sources. In 2005, a team of researchers in Maryland studied the effects of sulphoraphane, an antioxidant compound found in cruciferous vegetables, and found that it blocks an enzyme that causes joint pain and inflammation. In addition to aiding arthritis patients, it may be helpful for athletes who put a lot of pressure on their joints. Turmeric and ginger are spices noted for their anti-inflammatory benefit. Often used in Indian cuisine, turmeric also is used in traditional Asian medicine for its anti-inflammatory properties. A 2006 Arizona study showed promising research linking turmeric to the prevention of rheumatoid arthritis and osteoporosis. Add turmeric and ginger to smoothies, eggs, or sauces for an anti-inflammatory punch, Ms. DeJulius says. Green tea is one of the most widely consumed beverages in the world, and its effects on health is the subject of much research. A 2008 study in Maryland showed that green tea induced changes in arthritis-related immune responses. Long-term use of NSAIDs can have adverse effects and cause discomfort; the polyphenolic compounds from green tea possess anti-inflammatory properties and have been shown to be an effective complement to nutritional therapy. Ms. DeJulius recommends choosing organic green tea to reduce the exposure to pesticides. Ms. Bogden recommends avoiding certain foods if you’re trying to lessen joint pain. “Sugars and refined grains, including white rice, pasta and white bread, are the worst food culprits when it comes to reducing or relieving joint inflammation,” she says. Ms. DeJulius recommends limiting daily added sugar to six teaspoons for women and nine teaspoons for men. When using sugar, choose natural sources like honey, maple syrup, and coconut sugar. “Red meat such as beef, lamb, pork — anything from an animal with four legs — also will increase inflammation. Another big no-no, for many health reasons, is trans fat or partially hydrogenated oil,” she says. Ms. DeJulius recommends avoiding omega-6 fatty acids. The American diet is generally higher in omega-6s due to high consumption of processed foods. The extra consumption of omega-6s can promote inflammation. Sources include corn oil, safflower oil, sunflower oil, peanut oil, grapeseed oil and vegetable oil. Check the ingredients lists for condiments such as mayonnaise and salad dressing. If you feel that you’ve cleaned up your diet and are still experiencing food-related joint pain, Ms. DeJulius recommends meeting with a registered dietitian who is proficient in identifying food sensitivities for a personalized approach.